True to the name of this blog, our current apartment is tiiiny. Maybe 450 square feet? Last month we sacrificed some precious space to a perfectly small desk that we snagged at Goodwill, because I’ve wanted a crafting surface and storage space for supplies for a while. Finding the desk was easy, but finding a petite chair took a little more hunting; when I found a comfortable retro chair that was the perfect size for the desk (for only 12 bucks! 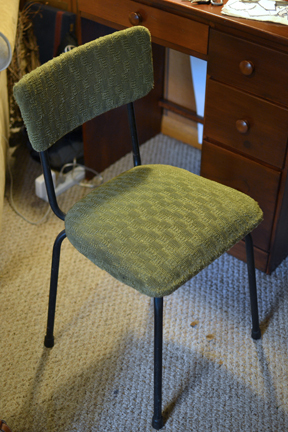 ), looking past the horrible, prickly, avocado green upholstery was the least I could do. Well, I could look past it for a little while. But I do love things to be beautiful, so this week it was time to give the little guy a facelift. This project was cheap, and I have enough leftover supplies that if I get tired of the current upholstery down the road, I can update the chair for only the cost of fabric. 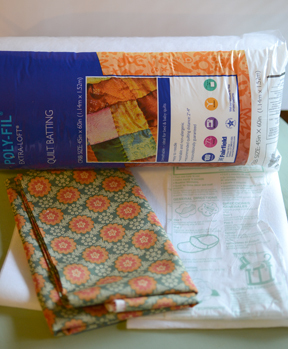 All it took was a yard of fabric, a yard of Pellon crisp craft interfacing (to reinforce a panel on the back of the seat back), and a crib-sized roll of extra-loft quilt batting. We used an industrial stapler, and I can’t imagine trying this without one! 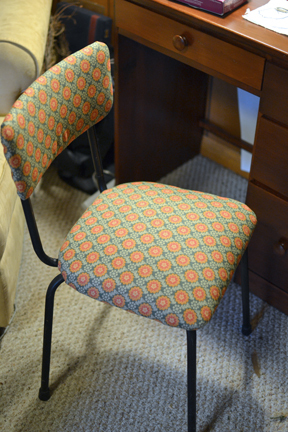 I used a cotton print (quilting calico) to upholster the chair. It won’t hold up as long as true upholstery fabric, but it was much easier (and cheaper) to find a calico that I liked, and I’m okay with having to replace it when it wears out after a few years. I’ll probably want a new color or pattern by then, anyway. 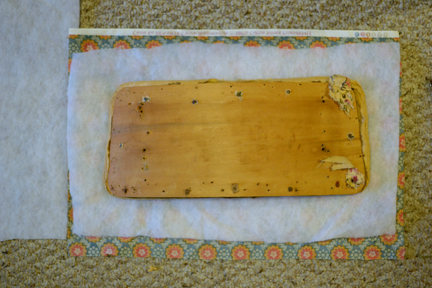 After removing the old upholstery, it’s time for the fun part! The padding on the seat and back was still in pretty good shape so I left it attached. 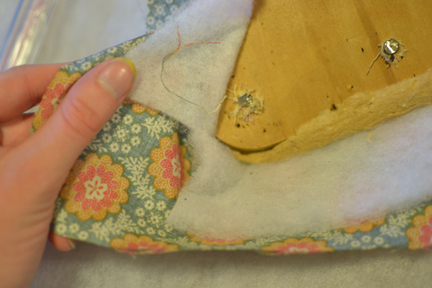 A layer of batting will smooth out any lumps or bumps in the padding, and make a nice under-layer for the calico. 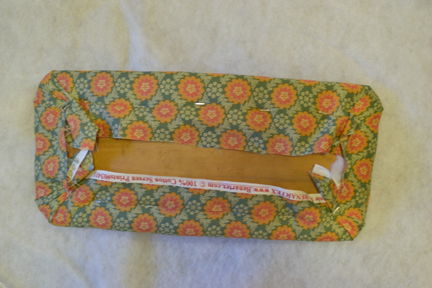 For both the seat and the back, I cut out pieces of batting and fabric that were a couple of inches wider than the surface they needed to cover. 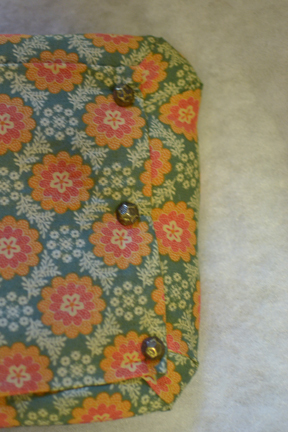 After checking to make sure that the fabric was straight (because who wants the fabric to lie crooked when it could be nice and straight), we pulled it snug and stapled in the middle of the top and bottom sides. 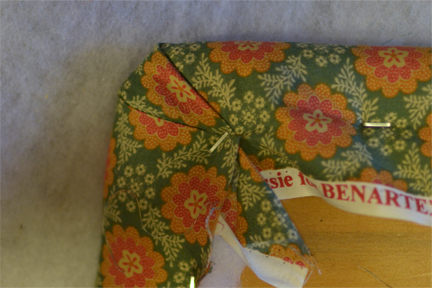 We worked our way to the edges, pulling tight and checking to make sure the fabric stayed straight as we went. And the seat back is done! I reinforced a rectangle of fabric with the Pellon interfacing, folded its edges over, and used upholstery tacks to attach it to other side of the seat back, so that you’re not looking at raw edges. Still retro, but clean and not scratchy! (And can you please ignore that pile of stuff next to the desk, which may or may not include our Christmas wreath? Small house storage problems…). Are you working on sprucing up anything at your home? I’d love to hear about it! Tags: decorating, DIY. Bookmark the permalink. Awesome job! Love the fabric you used.